Formed by former Type O Negative and Life Of Agony drummer/guitarist/vocalist Sal Abruscato, NY, US A Pale Horse Named Death were signed to SPV America in the fall of 2010. Their debut And Hell Will Follow was released in 2011, which was immediately noticed by the international Metal scene. 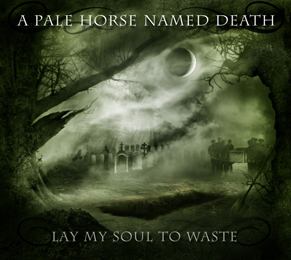 It's now 2013, and A Pale Horse Named Death brand new album, Lay My Soul To Waste is finally here. Particularly moving pieces would have to include opener “Shallow grave” with its haunting drum intro and mournful central riff, as well as “Devil came with a smile”, “Killer by night”, the heart-wrenching “Dead of winter”, and “Cold dark mourning” dedicated to the late Peter Steele, which swells with sinister portent . Truly though, if you are willing to at least temporarily give yourself over to the kind of all-consuming and enveloping melancholy this recording invokes, pretty much every track on Lay My Soul To Waste offers some manner of exquisitely beautiful Alice In Chains versus Type of Negative pain within which to wrap Sal’s twisted psyche. On this disc, Sal has once again surrounded himself with top notch producer and guitar player Matt Brown, drummer John Kelly and with each one pushing each other further past their limit. With their musicianship way above par and songwriting skills in-tact; the riffs, the hooks, and the overall mourning melodies are the focus of the strength. The atmosphere is haunting and powerful, the lyrics suitably drenched in sorrow. However, it is that honesty of despair that makes it a very good voice at day's end.